After a few days in Singapore on my return from the winter in the UK I sampled some delicious local food. I ate an amazing fish head curry which was cooked in a traditional Nyonya sauce. Nyonya food takes its influences from Chinese Malay cuisine but with a real south east Asian twist. 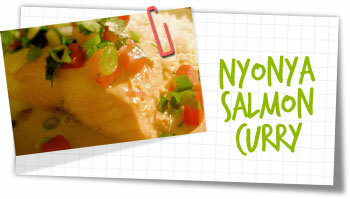 While this curry was delicious, I decided to recreate it at home using salmon instead of a fish head. It’s a little more appealing to most people’s palette. Be sure to use the garnish of tomatoes, spring onions and coriander for this curry. It REALLY makes a difference. Rub the salmon fillets in half the salt, cover and leave for 15 minutes. Pound the coriander and fennel seeds into a fine powder using a pestle & mortar. Place in a small bowl and set aside. In the pestle & mortar, pound together the lemon grass, turmeric, dried chillies and fresh chillies and 1 tablespoon water into a smooth curry paste. Set aside. Heat the oil in a wok over a moderate heat. When hot quickly add the powdered spices and curry paste and stir well, reduce the heat a little. Pour in 1/2 cup of the coconut milk and bring to a simmer. Let this simmer for 2-3 minutes until the oil separates. Now add the remaining coconut milk and 1 cup water, the remaining salt, fish sauce and sugar and bring to a gentle simmer, keeping the heat low for 12 minutes. Gently slide in the salmon and simmer, partially covered for 10 minutes until the fish is cooked through. Don’t stir the sauce as you’ll break up the salmon. Remove from the heat and check seasoning. Drizzle in the lime juice and shake the pan to mix in. Cover the wok and for the best results, leave for 30 minutes to develop in flavour. Gently reheat the curry until just bubbling and simmer for 1 minute to ensure the fish is hot. Carefully remove a salmon fillet and pour over some sauce. Sprinkle liberally with tomato, spring onion and coriander and serve alongside plain boiled rice.